Joel Dominguez is the Owner and Director of JoelSalsa Dance Company. It was a dream and mission of his to open up a dance studio and online studio where he can teach students from all over the world, the connection of Salsa music and dance. This is how Dance With Feeling and MySalsaOnline.com were born! Joel has danced, taught, performed, choreographed and competed throughout various parts of the US and Mexico.bbHe has been studying music and dance for more than twenty years and boasts expertise in a broad range of latin dances including Salsa, Cha-Cha, Merengue, Bachata, and Casino Rueda. He has appeared in commercials, music videos, news programs, and has danced professionally as a promotion for the incomparable, Gloria Estefan; but he maintains that his true passion has always remained with his ability to convey to others his enthusiasm for Salsa music and dance. 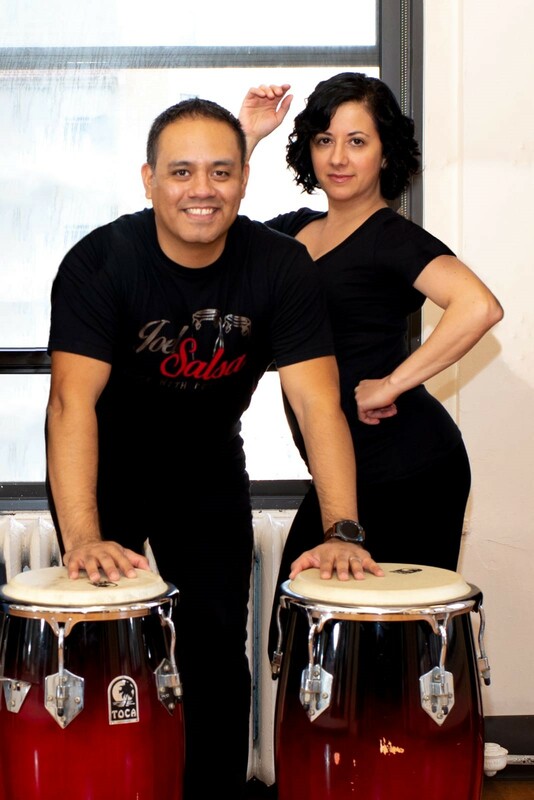 He is also co-founder and owner along with DJ Antonio “La Conga”, of one of the best and biggest events in NYC – La Vieja Guardia Salsa Social Events also known as LVG. Maria Palmieri is the co-owner and Director of JoelSalsa Dance Company. When Joel and her met on the dance floor they both discovered the same love and passion for Salsa music and dance! They both drove the same mission of opening a studio in NYC and an Online studio around the world! Maria’s love for dance transcends into her love for life. Dance for Maria is not only about moving your body but something much more important. For her, dance is life. Dance teaches you self-awareness, expression, how to give and take, and ultimately, how to live a happy and healthy life in balance. Maria’s hard work, dedication and passion for dance was recognized in dance competitions like the Manhattan Latin championships where she won 1st place as a newcomer and 3rd place in the Latin championship. Maria is certified as a professional dance teacher by DVIDA – Dance Vision International Dancers Association (DVIDA®) structure which is recognized by the Nation Dance Council of America.